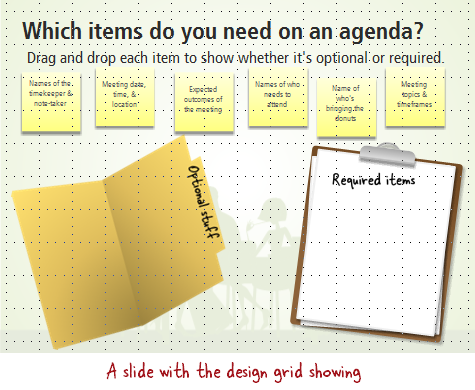 The design grid, drawing guides, and ruler in Storyline makes it easier to position and align objects on your slide. In this tutorial we'll look at how to set your preferences for these features. On the View tab, mark Gridlines. Or, press Shift+F9 on your keyboard. Or, select any object and, on the Home tab, choose Arrange, then Align, then View Gridlines. Or, with an object selected, click the Format tab, choose Align, and select View Gridlines. Or, right-click in your slide workspace, choose Grid and Guides, mark Display grid on screen, and click OK.
You can turn the grid off by using the same steps. Select an object, click the Home tab, and choose Arrange, then Align, then Grid Settings. Or, select an object, click the Format tab, choose Align, and select Grid Settings. 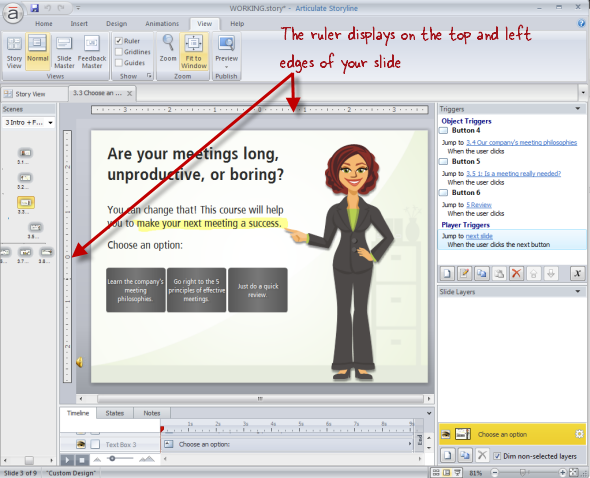 Or, right-click in your slide workspace, and choose Grid and Guides. Or, on the View tab, click the small arrow in the lower-right corner of the Show section of the ribbon. Spacing: Under Grid settings, use the Spacing field to enter a value for the grid spacing, or use the arrows to increase or decrease the value. Display grid on screen: Use this box to turn the grid on or off. Display drawing guides on screen: Drawing guides are useful line rules that you insert on your slide to help align objects. They won't appear in your published output; they're only visible when you're editing your slides. The drawing guides you add to any slide will appear on other slides within the same project too. See below for more on how to add, adjust, and remove guides. Display smart guides when shapes are aligned: Smart guides are temporary visual guidelines that appear when you're moving objects around and two objects come into alignment with each other. They disappear as soon as you release your mouse button to place the object where you want it. Mark the box if you want them to appear, or unmark the box if you don't want to use smart guides. Set as Default: Click this button if you've changed the settings on the Grid and Guides window and want these settings to apply to other Storyline projects that you open. Drawing guides are useful line rules that you can insert on your slide to help align objects. Just like the design grid, drawing guides won't appear in your published output. They're only visible when you're building or editing your slides. 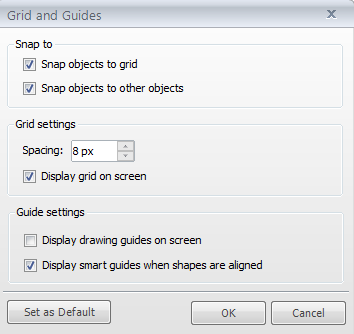 You can turn drawing guides on or off in the Grid and Guides window shown above, using the checkbox called Display drawing guides on screen. Or, you can go to the View tab, and mark Guides. To move a guide: Just click and drag a guide to move it. When you do, an arrow and a small box appear, showing the number of pixels you've moved it. Positive numbers indicate a rightward or upward position (as compared to the slide's center), and negative numbers indicate leftward or downward. To create a new guide: You can add another drawing guide to your slide by holding down your Ctrl key while clicking and dragging an existing guide. The existing guide will stay put, but a new one will appear where you drag. Release your mouse button when the guide's in the position you want. To remove a guide: If you've created a drawing guide that you no longer want to use, just click and drag it on top of an existing guide, and it'll disappear. The Storyline ruler is another handy alignment tool, because it makes it easy to position drawing guides in exactly the right place. It also makes it easier to add shapes right where you want them. When you display the ruler, it appears on the top and left edges of your slide. Anytime you move your mouse or a drawing tool around on the slide, or when you change the position of a drawing guide, its movement is traced on the ruler. Go to any slide and click the View tab. Then mark the Ruler box. 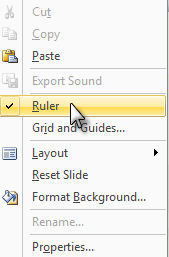 Or, right-click in your slide workspace and choose Ruler.